NetHub requires .NetFramework 3.5 SP1. 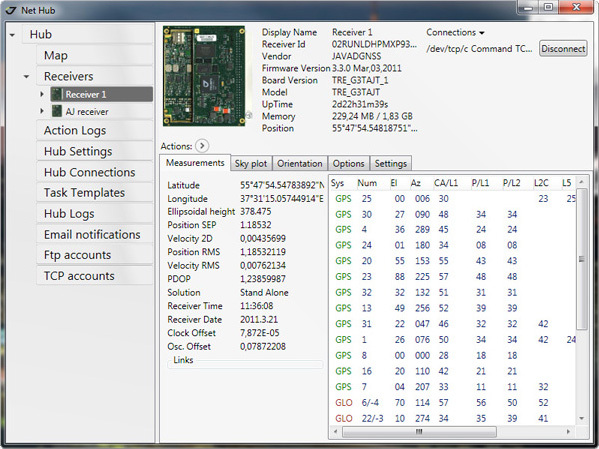 NetHub is a Windows® application designed for controlling GNSS receivers developed by JAVAD GNSS, INC.
Manual Mode terminal allows sending GREIS commands to receiver. The Autocompletion System helps to design a command easily. Subfolders by dates, receiver name, ID, etc. Hard Disk: more than 10 GB free disk space may be required (determined by the total size of the memory allocated for all connected receivers). RAM: 1 GB or more (4 GB recommended). 32-bit or 64-bit Windows Operating System. Color monitor at 800x600 screen resolution. Starting with NetHub Version 4.5.7.9 the numbering (Name) of the Mount Points will match the table below. New corrections formats will be added to the end of the list.